"Is be, or is be not, is be one big damn puzzler." Love, loss, Shakespeare, anthropology, subterfuge, globalism, language, obsessive-compulsive disorder and cheerful communal defecation - really, does a book need anything more? 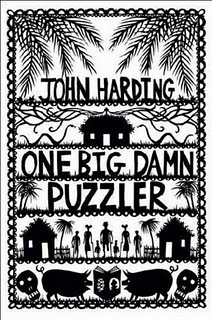 Having just finished One Big Damn Puzzler, a novel by John Harding in which a remote South Pacific island plays host to an uptight American lawyer intent on righting the past wrongs of his countrymen, I'm inclined to say not. It's common for hyperbolic reviews to claim a book 'will make you laugh and cry', but One Big Damn Puzzler did absolutely that, and sometimes in the most unexpected of ways. The title comes from Hamlet, of course. If you don't remember Shakespeare writing that line, that's because this Hamlet has been translated into the local pidgin English by Managua, the enigmatic tribesman whose literacy (and cunning) gives him the edge over his fellow islanders. The startling ways in which the islanders use their form of English to render certain concepts is often played for laughs, although never in a way that patronises the speakers; often, it's the islanders' language itself that seems to draw us into the book and creates the world in which the events take place - rather as Florence's idiolect did in the last of Harding's novels that I read, Florence & Giles. The vivid simplicity of their language, and the way that words are turned about to give them a whole new perspective, seems to echo the islanders' lives and beliefs: sometimes familiar, sometimes incomprehensible, and sometimes simply working to a different, but entirely valid, logic. William Hardt, the fastidious, wary but ultimately well-meaning lawyer who inadvertently shakes up the status quo, is at first baffled and frustrated by the islanders' firm belief in magic, as most of us would be, and yet his OCD behaviours are simply a set of private magic rituals of his own. Similarly, his taboos - he's less than delighted when he's expected to make a daily public trip to the communal 'shitting beach' - are really no more rational than those of the islanders, who believe you can sleep with pretty much whoever you like before you're married, but sharing a meal in a partner's house is a dangerous no-no. The way that William gradually comes to value the island, its people and its culture is touching and convincing, albeit ultimately bittersweet: One Big Damn Puzzler is often moving, but it's never sentimental, and there's often a sting in its tail. Full of echoes of Shakespeare - boys dressed as girls are a recurring theme, for instance, and sometimes even boys dressed as girls dressed as boys, as are ghostly fathers and comic love spells - One Big Damn Puzzler is a rich and multi-layered novel full of endearing, larger-than-life characters, many of whom I'm sure will stay with me for a long, long time. This book had me weeping like a baby at a scene in which a pidgin-speaking Hamlet addresses the exhumed skull of his late 'she-boy' admirer, such is the author's skill in making us absolutely a part of the islanders' topsy-turvy world. I would heartily recommend it.